Different frontends allow xi-editor to run on the desktop, in a terminal, or even on a smartphone. To get started, find a frontend that's compatible with your platform and follow the installation instructions. We occasionally publish updates about development on the backend and frontends. Curious about technical details? Under the hood, xi-editor uses a CRDT and a persistent rope to manipulate text efficiently. The documentation pages explain how all of this works. 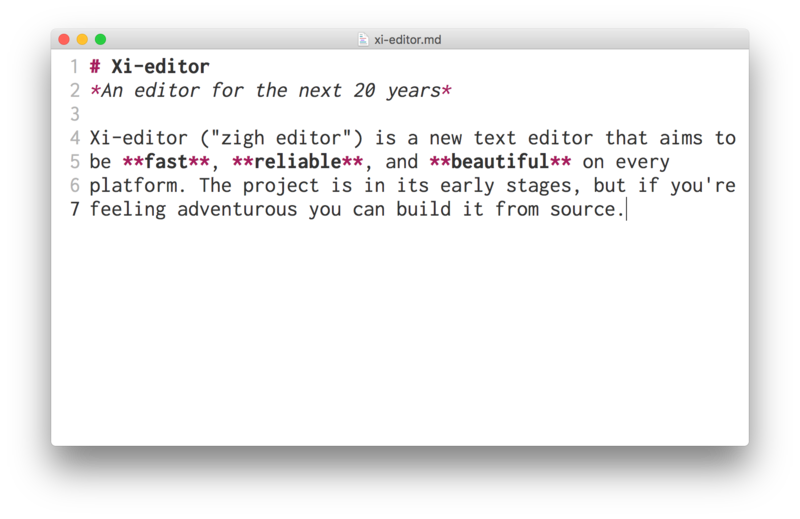 Xi-editor is an ambitious, early-stage project, and there's a lot to be done. If you're interested, check out our issue tracker and roadmap. Pull requests are always welcome.